If you have been interested in feng shui for a while, most of these feng shui cures are quite familiar to you. And if you are new to feng shui, most of these feng shui cures are quite familiar to you, too. Find out how these beautiful decor elements can bring great feng shui energy to any home or office. The lucky bamboo is one of the most popular feng shui cures and a beautiful addition to any home. 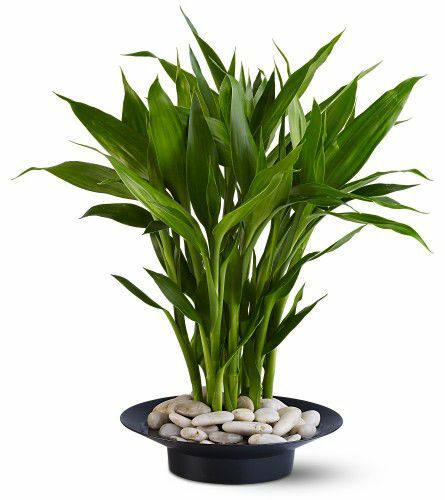 Easy to care for and a very tolerant plant for your home, the feng shui lucky bamboo teaches the ultimate wisdom: how to be flexible and hollow (open) on the inside, so that the spirit can freely flow and heal your being. Bamboo is also a symbol of good luck in feng shui. We loved this vibrant and elegant lucky feng shui bamboo composition in a simple black base with white rocks. It will look good with any home or office decor scheme. Go for it. This beautiful fountain is an all-time feng shui favorite and can be used both indoors and outdoors, at home or in the office. The Water Bell fountain combines the soft sound of the free-flowing chime bells with the soothing water energy creating a very peaceful and sweet energy indeed. You can use it at home, you can use it in the office, or place it in your garden for excellent feng shui. Made by Woodstock Chimes, the "Master Chimer". Need we say more? Do you often light candles in your home? We hope you do! And how many beautiful candleholders do you have to support the fire feng shui element energy in your home? Be it with fire color candles or candle holders, be sure your home benefits from this powerful feng shui element. The right feng shui use of art can considerably improve the energy of any space, be it home or office. Choose art according to the feng shui energy you need, such as soothing and sensual in the bedroom, or active and vibrant in the home office, for example. Good feng shui art is also a great way to bring the energy of the five feng shui elements as required for each feng shui bagua area. The energy of this classical image is full of romance, elegance, and love. Excellent feng shui for love cure to be placed in the Southwest area of your home, or in your bedroom. Also an excellent feng shui gift! Chimes have many applications in feng shui. Even though we think the best use of wind chimes is outside the home, many chimes have become a popular home feng shui cure. No matter you use it in your home or in your garden, this high-quality Woodstock chime has an exceptionally beautiful sound and will surely become your favorite feng shui decor item for many years to come. Do you have an essential oils diffuser in your home or office?. The daily use of essential oils in your home or home office is excellent feng shui. You can use essential oils for various purposes - from purifying to relaxing, from energizing to creating a very sensual mood - and this simple diffuser is a beautiful way to release the power of scents into the air. Easy to use, and with a simple, calming design, this essential oils candle diffuser is an excellent feng shui addition for any bedroom or bathroom. Mirrors are called "the aspirin of feng shui" for a good reason!. Mirrors are called the aspirin of feng shui; with proper placement, they can dramatically shift the flow of energy in any given space. Mirrors also bring a sense of refreshment and calm. We fell in love with this beautiful mirror - feminine, gentle and with a very graceful energy - is your home asking for a mirror? Feng shui tip: Never place a mirror to reflect your bed or your front door. The feng shui energy of calm and tranquility comes from the Buddha presence. You might have a busy lifestyle with not much time for meditation and yoga, but you can always bring a tranquil, serene presence into your home with a beautiful Buddha image. We liked the look and the feel of this Buddha sculpture, it will complement the look of any home or office decor scheme and will surely​ bring you the calm you need! Excellent feng shui addition to the main entry or the living room.